Three 18-Foot Industrial HVLS Fans Help Get Drivers Back on the Road Again at Don Hummer Trucking’s Gretna Service Center. While over-the-road trucks typically travel a few thousand miles each week, sooner or later they’ll need some kind of required maintenance or repair to stay on the road. That’s no surprise since out of 2.7 million tractor-trailers in the U.S., they racked up an estimated 280 billion miles traveled over a recent one-year period (2017 Pocket Guide to Large Truck and Bus Statistics, Federal Motor Carrier Safety Administration’s Office of Analysis, Research, and Technology). For companies like Don Hummer Trucking, operating a dedicated service and repair facility in Gretna. Neb. is a very smart move. The operation keeps the company’s several hundred truck over-the-road fleet in constant motion and on time for customers. Generate a high volume of air movement, provide relief from humidity and deliver energy savings for an L-shaped 17,000-square-foot trucking maintenance facility. Three strategically placed Entrematic I-Class™ 18-foot diameter industrial HVLS fans operated via Entrematic’s digital touch-screen remote. Increased comfort for employees year-round while saving the owner an estimated 20 to 25 percent on heating energy costs during the winter months. Watch the Hummer Trucking Customer Story. rest are operated by independent contractors. Bill Harris, previous owner of Harris Quality Inc. which Don Hummer Trucking has since acquired, originally built the Gretna Service Center. Primarily an over-the-road operation, Don Hummer trucking transports dry goods, refrigerated and frozen foods including meats, office products, and more. That means that the company’s equipment needs to remain in tip-top condition at all times. That also requires that the mechanics and other service personnel at the Gretna Service Center must remain in top form as well. “You could say that we built the facility to handle ‘Indy 500 type truck repairs,’” explained Harris who oversaw all of the planning that went into the Gretna Service Center. 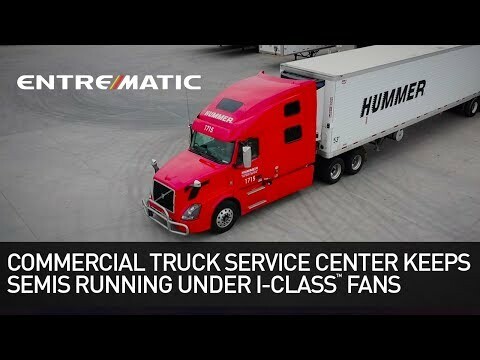 “The facility focuses on minor to major repairs—a triage approach, if you will—along with some engine work, body and panel damage as well as preventive maintenance on trailers and safety inspections.” The Gretna Service Center is not a for-hire operation and is only dedicated to Don Hummer Trucking’s fleet. Harris said that when the decision arrived to move forward with a new service facility for what was then Harris Quality Inc., air movement was top of mind from the beginning. It coincided with planning for the number of service bays, the size of doors, as well as needed office space. Harris shared he was determined that the design for air movement was going to well surpass the approach taken in his previous service facility. “We were using some really ‘cheesy’ fans that really just didn’t do the job, were a big waste of energy and really just collected dirt,” Harris admitted. “They were a big waste of energy, too far up in the ceiling and way too small. You couldn’t even feel what air they were moving.” His company even experimented with barrel fans and others, but none of them provided what he needed. Harris said that he looked for the best possible high volume air flow solution for his new facility. After temporarily evaluating one of the most highly recognized names in the industry, he was referred to and ultimately ended up choosing Entrematic because the company and its products were a much better fit. The Gretna Service Center now operates three strategically placed Entrematic I-Class™ 18-foot diameter industrial HVLS fans operated via Entrematic’s digital touch-screen remote. The Gretna Service Center’s mechanics handled three of the fan installations, which only took a few hours from start to finish, Harris pointed out. Harris continued that his new facility really needed a fan in its tire repair area where the working conditions can become very hot with virtually no air movement without an HVLS fan. In other work areas, service bay doors are open as much as possible to let air in, but that also lets the sun beat in directly on the mechanics and other personnel. With the Entrematic fans running, even when the humidity is at its worst, Harris stressed that the fans get the job done and make working conditions much more bearable for everyone. The sun isn’t the only heat source that Gretna Service Center’s mechanics must deal with daily. Once rigs that have been idling outside for long time periods enter the facility, they emit their own source of discomfort for anyone nearby. “The fans work hard at providing personnel relief from the hot equipment and help reduce fatigue which gives everyone a working chance at staying busy during the work day,” Harris related. Harsh, cold winters in Nebraska provide a totally opposite challenge to keeping mechanics in the service bays warm and comfortable. A key part of the solution is the Gretna Service Center’s heated floors which radiate warm air that then rises toward the ceiling. Harris explained that running the Entrematic fans in reverse in the winter mixes the rising air perfectly. “When the service bay doors are opened to let trucks enter and exit, you don’t feel any real sudden change in temperature and there’s no long recovery time once the doors are closed,” Harris added. But the radiant heat floors were not always performing like they do today. During the Gretna Service Center’s first winter in operation, that part of the project ran into an unexpected delay leaving no heat in the facility, other than what a recycled oil heater was generating. However, with the three Entrematic fans installed and running, they helped keep the facility at an even 68 degrees F for the entire winter. Without the fans, the single heater would not have kept up, requiring another expensive heat source. Now, Harris estimates that with the fans running in reverse during the winter, the Gretna Service Center saves between 20 to 25 percent on its energy costs because the heated air is mixed so well. That means there is no need to “overheat” the facility. “Entrematic’s fans are invaluable to the entire operation, not only for our employees’ comfort but in terms of saving money on energy, too,” he stressed.